With so much on your plate, every second counts. That’s why we love the simple task automation tool, Zapier. With Zapier, you can easily automate pesky, repetitive tasks that eat up a lot of time, create room for error and yet add little value to your day. You already may know that Hatchbuck automates your marketing by sending super targeted emails and campaigns to your contacts based on their interests. 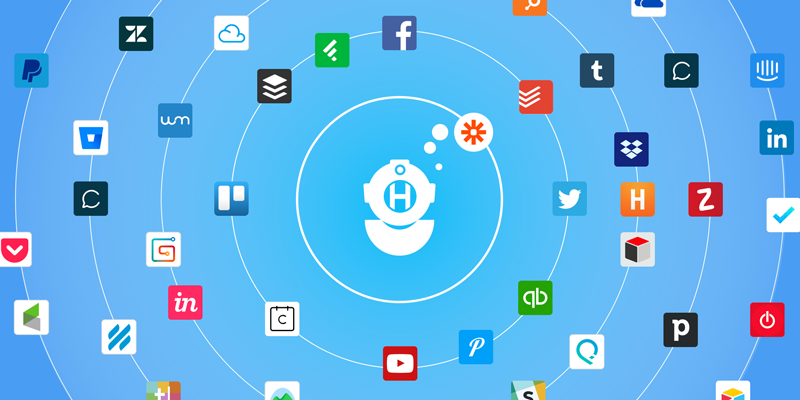 But when you use Hatchbuck in tandem with Zapier, you open up a whole new world of automation. Webinar sign-ups and conference attendees are awesome for your list, but what happens when the event is over? With Hatchbuck and Zapier, you can keep the conversation going long after your event to stay top of mind and turn those top and mid-funnel leads into customers. If your website is built for conversion, you have a steady stream of leads coming in from landing pages and forms. With a simple zap, you can harness the nurturing power of Hatchbuck to send targeted emails over time to turn new leads into customers. Using Hatchbuck for marketing automation, but storing contact information somewhere else? Zapier can help add and update contacts in other spreadsheets, databases and CRMs for data that is clean, usable and up-to-date. What’s even better than landing in the email inbox? Getting a text message right in the hands of your prospects and customers. Use Zapier’s built-in SMS app to easily send a timely text message as part of a Hatchbuck email campaign. Whether you’re calculating your business’s NPS score, or simply adding new details to contact records, surveys are an easy way to learn valuable information about your prospects and customers. Automatically add and update contacts with a zap. Scheduling tools are super useful for setting up meetings and appointments on the fly. With a zap you can use Hatchbuck tag rules to update contact information (like change contact status from lead to hot prospect) or start a follow-up series of emails to keep your contacts in the loop post-meeting. If you’re anything like the Hatchbuck team, you live in Slack. Get Slack channel notifications about your Hatchbuck contacts to keep on top of hot prospects or important customers without logging in to Hatchbuck. What’s even more awesome than forms for capturing leads on your website? Live chat tools are the perfect way to engage with hot leads. Create a zap to pull those contacts into Hatchbuck for instant lead generation. There’s nothing better than consistent data across apps. Keep Hatchbuck up-to-date with contact details from your invoicing and accounting software – or vise-versa. With Zapier, you can enrich your customer experience by keeping tabs on your contacts’ support ticket activity. Give your sales team the power to send an email personalized with Hatchbuck contact data right from their Gmail account – creating that one-on-one inbox experience for your sales opportunities. Turn social media activity into sales. Automatically import new leads from Facebook. Send a tweet as part of a Hatchbuck campaign to keep prospects engaged on their favorite platform. Or, turn social media contest participants into bonafide leads for your sales team. An ecommerce sale is nothing without targeted follow-up. Add new contacts to Hatchbuck from ecommerce apps and keep the conversation going with targeted Hatchbuck campaigns. Turn one-time sales into repeat business. This is just the tip of the iceberg to help you brainstorm new ways you can be automating your business behind the scenes. When it comes to generating sales for your B2B, you need to take advantage of every opportunity in your pipeline. With Hatchbuck + the power of Zapier, you can automate your marketing and sales process to swiftly and accurately turn your contacts into new opportunities and new business. Learn more about using Hatchbuck and Zapier to generate leads and automate sales and marketing with a live demo.